Doc Calitri Invitational • And More! South Point Hotel & Casino, Las Vegas, NV. Tow Industry Week offers multiple conferences, AT's legendary hospitality, special events, and the American Towman ShowPlace, featuring the industry's top suppliers. This year many activities and the Expo itself will be inside one of Las Vegas' most unique exposition facilities: South Point Hotel & Casino which boasts of its own exhibit Pavilion & Arena. 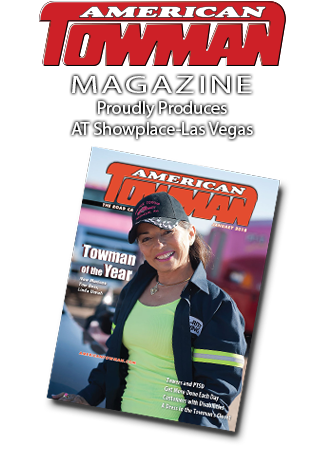 Co-sponsored by TowIndustryWeek.com, towing's exclusive online weekly publication, and American Towman Magazine, the industry's leading monthly magazine, American Towman ShowPlace - Las Vegas will put you face to face with suppliers, educators, top trainers, and leading towing professionals from around the world. No one does educational conferences like American Towman. Get in on these in-depth Intelligence Briefings critical to a Commander In Chief of an emergency road service operation. Learn from industry leaders about crucial issues in managing a towing business. $125 Intel Passport through advance registration gets you access to all the seminars you are able to attend. Price increases to $195 on May 7th, so register today to SAVE BIG! This seminar will cover lines to the load, how line angles affect line loads, traveling versus fixed blocks, and simple versus compound rigging. Terry Abejuela, American Towman Magazine; Thursday, 8 a.m.
Foundational training on lockout basics with a focus on damage prevention. Topics include basic lockout guidelines, discussion of locking mechanisms, safety around airbags and key lockout techniques. Don Eliason, Automobile Club of Southern California; Thursday, 9 a.m. This session will provide a background of new trends in the electronic payments industry that you should know to help you save on your credit credit card costs. Updates will be on new rules allowing businesses to pass on the charge to the cardholder saving hundreds of dollars to the towing company, new trends in online and mobile payments, payments as a cost to your business and discuss how we are benefiting the CTTA through our partnership program. Peter Sloan, NXGEN; Friday, 8:00 a.m. This session is designed to help companies and operators come to a better understanding of their "Why" so they can excel as individuals and inspire those around them in their company and those they seek as customers. It will give tow professionals the tools to encourage a more positive public perception. Bear Godfrey, WreckMaster; Friday, 9 a.m.
Seventy-one percent of entrepreneurs plan to retire in the next 10 years, but most are woefully unprepared. Join Automotive Training Institute as they share how to create the life you want in your golden years. Jim Silverman, ATI; Thursday, 8 a.m.
An in-depth discussion on the use of sensors, telemetry and IT to provide real-time feedback to make smart business decisions. Daniel Young, US Fleet Tracking; Thursday, 8 a.m. Exploring the broad scope and reach of the OSH Act, which is where OSHA and related state agencies draw their authority from. It will also discuss the differences between state and federal enforcement and how in California the Division of Occupational Safety and Health-- CAL/OSHA--applies. Brian J. Riker, American Towman Magazine; Thursday, 10 a.m.
Are You Busy? Or Just Dizzy? John Borowski, Auto Return; Thursday, 11 a.m.
What it takes to be that positive, multi-tasking personality, necessary to taking calls, balancing call-volume, auto clubs, law enforcement, customers, accounts, and the most difficult undertaking, caring for challenging tow truck drivers. Randy Resch, American Towman Magazine; Friday, 9 a.m. Liquid debris cleanup is an untapped revenue resource for towers as first responders. This seminar will also address the law and regulation, dealing with the insurer, proper cleanup and getting paid. Jim Figueira, Environmental Chemical Solutions; Friday, 9 a.m. Tired of losing cash/cod calls because of price? Learn how to sell value over price and how to get over the price objection. Learn how to train your dispatch how to make the sale. Mike Porter, Speed’s Towing; Friday, 10 a.m.
Pricing: Are You Leaving Money on the Table? Do you know where you need to be on pricing? John Borowski, Auto Return; Friday, 10 a.m. This presentation focuses on the need to deploy simple techniques and devices to make your on-scene presence OBVIOUS, and, provides advanced emergency warning to approaching motorists. Randy Resch, American Towman Magazine; Thursday, 9 a.m. Hear how transportation leaders have driven measurable impact through new, easy-to-deploy programs, and how you can use those same strategies to improve the safety of your fleet. With the rampant increase in distracted driving towers need every advantage available to avoid costly accidents. A presentation on the dynamic nature of tow trucks when loaded v. empty, following distance and other traffic hazards surely could help prevent some crashes. Brian J. Riker, American Towman Magazine; Friday, 8 a.m. Topics include arriving at the scene safely, proper parking of the truck, proper use of emergency lighting and work lights, customer safety and avoiding the traffic side of the truck. Terry Abejuela, American Towman Magazine; Friday, 10 a.m. Learn how recent changes to mobile web architecture, quick-load content creation, click to call ads and customer review requests will affect how you get found online. Dennis Wencel, Lift Marketing Group; Thursday, 10 a.m.
Join OMG National for a session on how voice search, chatbots and reviews are driving new business. Mike Rappaport, OMG National; Friday, 8:00 a.m.
A great Conference for officers of state associations and tow company owners. Tools to effectively interact with your state legislators that will help get laws favorable to the towing profession passed. Brooks Ellison and Kirk Blackburn, Ellison Wilson Advocacy; Joanne Blyton, TRAA-LAN; Sam Johnson, TROC, CTTA; Thursday, 10a.m. – 12 p.m.
Strategies for increasing your town's regulated rates. Having statistics to back up one's case for a rate increase can mean all the difference. The Conference will also cover ways to cultivate a strong relationship with the town and the police department. Ron Myers, Police Towers of America; Saturday, 9 a.m. – 12 p.m.
Includes Conference Passport and access to all the week's seminars. $125 advance registration fee; $195 on site - Save $70 by registering now. The nation's top trainers are in the South Point Arena and are ready and eager to teach YOU how to be the best tower you can be. This year, we are offering Light- and Heavy-Duty training, from the CTTA and WreckMaster, respectively. Click the menu items to see more information about each training. Receive 12 hours of training with WreckMaster instructors (open to all towers): 8 hours classroom, 4 hours hands-on with equipment in the South Point Arena. 12 hours of training with WreckMaster instructors, and open to all towers. Wed. May 8, 8 am - 12 noon classroom, 1 pm - 5 pm Hands-On Arena. Thurs. May 9, 8 am - 12 noon Classroom. The California Tow Truck Association Light Duty Level 1 Certification course is a 16 hour program approved by the California Highway Patrol for their Rotation Tow program.The course introduces students to the proper use of light duty towing and recovery equipment and acceptable standards in the industry. New and experienced tow truck operators will benefit from the 8 hours of classroom instructions and 8 hours of hands on demonstrations. Each student will receive a comprehensive training manual and must pass a 50 question written exam to be issued a certificate and ID card. All towers may participate - you do not need to be a CTTA member. Wed. May 8, 8 am - 6 pm classroom. Fri. May 10, 1 pm - 2pm Certification Testing. This is the famous 8-hour course that teaches fellow towers how to become more profitable for the work they do. Fee: $1850, includes two company personnel, and Conference Passport and exhibit floor badge. This multiagency incident management class is being required all over the US for towing providers that participate in law enforcement tow rotation. Don’t miss this opportunity to receive a Certificate for participating in an excellent hands-on training. Jose Norena, Big Valley Towing; along with representatives from Nevada Highway Patrol, NDOT Maintenance, Las Vegas Fire, Parsons Transportation. Wednesday, 1-5 p.m.
American Towman Expositions are more than just tow shows; our Legendary Hospitality puts us a cut above the rest! Select one of the events from the menu to get started and prepare for our networking opportunities, parties, product demos, and more. At TopGolf, there's no pressure to be good. Take a swing, score some points, have some laughs and enjoy great snacks. Any way you play, it's a great time for all. Transportation and refreshments are included. TopGolf pioneered a technology to make golf more fun and engaging. It has since emerged as a global sports and entertainment community focused on connecting people in meaningful ways. At TopGolf, there's no pressure to be good. Take a swing, score some points, have some laughs and enjoy great snacks. Any way you play, it's a great time for all. Friday, 8:30pm; 21 and over, please. Complimentary Shuttle starts at 7pm. Named for veteran training director for the CTTA dubbed the "Godfather of Towing", the Steve Cardinale Memorial Smoker provides attendees with a complimentary cigar and unrivaled camaraderie among your fellow towers. Become a VIP Smoker and gain exclusive access to the big gazebo by the pool at the South Point Hotel & Casino. South Point Arena Concourse adjacent to the South Point Hotel Pavilion. Take a load off and kick back! The ATShowPlace Welcome Reception is the perfect way to relax after travelling, meet up with old friends and make some new ones as we get ready to enjoy the best tow show in the West. This welcome celebration is provided compliments of participating motor clubs. Wednesday, 5/8, 6pm. FREE. Arena Concourse. The Doc Calitri Invitational 12 Hole Tournament is a one-of-a-kind golf outing designed with your busy schedule in mind; from the affordable entry price to the shorter 12 hole round. With fewer holes to play along with a shotgun start gives you 3 hours on the course leaving you time to unpack and get to the evening’s events. 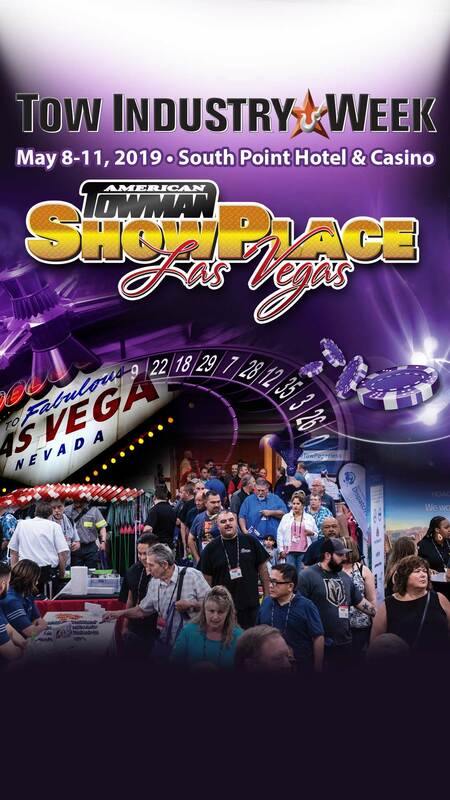 Have fun networking with towing's finest and still have time to spare to set up your exhibit and attend all that the American Towman ShowPlace offers! Join us for our wrap-up hospitality event, the RibsFest, where we will crown the winners of the American Towman Cup in the Winners Circle! RibsFest is FREE so bring all your workmates and family to fill up on the feast while you cheer on the winners of the best trucks that have been on display in the Arena all throughout Tow Industry Week. Join us for an intimate concert with Mike Corbin. Seating is limited to 100, so it’s nearly your own personal, live concert. Mike is a multi-talented performer who writes, sings and plays his own original work. He is also the only artist that has created popular ballads that pay tribute to the Towman, calling attention to this tough, dangerous work that is so vital to keep America’s highways open and motorists moving. Mike’s music has become well known to towers and the people who love them and especially Spirit Riders. Luncheon is hosted by American Towman to celebrate the success of the Top 100 Towing & Recovery operations in the U.S. You are the pride that leads the pack, helping to generate the well-deserved respect and increase the level of professionalism for all hard-working tow business owners and operators. This is a rare opportunity to meet the competition on neutral ground, break bread and share stories of success and failure. Learn about the future of our industry and form lucrative new relationships. The Towman 100 recipient will receive a coin and complimentary lunch. Friday, May 10, 12 noon, on the Concourse. Guests and additional attendees will pay $40 for a 3 course lunch. All of the live demos are held in the South Point's air-conditioned arena, and are free to attend with your A.T. ShowPlace - Las Vegas badge. While the South Point Arena is known internationally as the best Equestrian facility in America, we won't be showing any horses, but we're sure to have some big booms, rotators, and maybe even a steel horse, or two on hand. Make sure to put these don't-miss-demos on your calendar! Bring the kids or have a date night while you enjoy an evening of bowling. Knock down the pins and cross off those numbers as you compete for prizes. Always a stress-free fun time, come with a group or plan to make new friends along the way. The ACE Award goes to the top 1% of towing operations for service reliability and professionalism, based on meeting ETAs and overall customer satisfaction. The award is given by American Towman Magazine and co-sponsored by GEICO and Road America. Nominating clubs include Agero, Motorcycle Towing Services, Nation Safe Drivers, Pinnacle Motor Club, Quest Towing Services, Road America, Roadside Protect, and USAC/MD. The California Tow Truck Association holds its Annual Convention at South Point Hotel & Casino as a part of Tow Industry Week and the American Towman ShowPlace - Las Vegas. All towers are welcome. You do not need to be a CTTA member to attend. The towing industry's most amazing wreckers from the West compete for the American Towman Cup. Pageant contestants vie for the Cup in several weight classes. Entry fee: $50 for light duty (pre-2018), Light duty (2018-2019), medium duty, Vintage (pre 1992), service/support truck. $75 for HD Single Axle, HD Tandem, Rotator, Carrier. A towing company may enter one truck per class and up to four trucks. Whether you compete in the Pageant or take it all in and vote on your choice picks, the spectacle of the world's finest wreckers at the American Towman Cup is a great experience. South Point's gaming amenities include more than 2,563 of the most popular slot and video poker machines featuring ticket-in, ticket-out technology. The casino pit features over 60 table games including 21, Craps, Roulette, Fortune Pai Gow Poker, Baccarat, Ultimate Texas Hold 'em and Three Card Poker with Progressive. A freshly designed Race and Sports Book features over 300 seats with separate viewing areas for horse and sports action. The Del Mar Lounge provides the perfect place to grab a beverage and watch the action. The bingo room has 600 seats and features Cash Ball and the Progressive Double Action Jackpot. In Addidtion to housing many additional exhibits taking place at the South Point arena, adjacent to the exhibit hall, are recovery demonstrations, recovery training, and the American Towman Cup wrecker pageant. Luxury vehicle training takes place on the Arena Concourse level. Of all the things Las Vegas is famous for, this may a first. Apparently, this is a thing – Banana-infused Whisky from Ireland is becoming popular in Las Vegas. From a company called Ambros, this spirit was launched last August and is a hit with nightclub guests on the Strip. No sugar of flavors added, just infused with real bananas. What you drink in Vegas….they probably haven’t heard of at home yet. 16 theaters are available for your viewing pleasure. A premium viewing experience, picture, sound, & luxury seating. You can also enjoy the "Classic Series" - Your favorite movies digitally restored. A premium viewing experience, picture, sound & luxury seating in theaters #9 and #10. Bowling at the South Point 64-lane Bowling Center is state of the art, offering a main center aisle with 32 lanes of bowling on each side. Tables are equipped with touch screens so everyone can keep track of the game. A bar adjacent to the lanes allows a guest to enjoy a cold beverage without missing any of the action. There is also a full-service pro-shop, snack bar, locker rooms and an arcade. From the novice to the pro, everyone can enjoy the fun and excitement the South Point Bowling Center has to offer. Click below for menu and availability for the resort's restaurants. The South Point features a variety of menu items and award winning restaurants for every price range and appetite. Restaurants in this new destination resort are designed to provide the foremost culinary experience to all diners. Spa Costa del Sur is the place for you. With more than 40,000 square feet, 28 treatment rooms and a full-service salon, relaxation is our specialty. The Spa caters to both the busy traveler who rarely takes time out for themselves and the leisure traveler who is seeking pure indulgence. The spa is designed to pamper, relax and rejuvenate. They offer one of the most extensive spa menus in the city. Some of the Spa's most popular treatments include Facials, Body Treatments, and Massages. At Spa Costa del Sur, we offer the most cutting-edge treatments for men, women, couples and teens, to the tried and true massages, facials and body treatments. We specialize in corrective and rehydrating treatments for the face, hands, feet and body, and offer 10 different scented massage lotions for guests to choose from. It's all here: the exhibits, conference seminars, training, demonstrations, celebrations, plus a movie theater, bowling lanes, cabaret club, live Las Vegas shows, and great restaurants. Don't fall prey to bogus hotel booking services who claim to represent American Towman or AT Expo! They may be calling or emailing you and offering cheaper hotel accommodations and even booth rates. But please be aware that they are fraudulent and are not actually booking a reservation for you. They are only taking your credit card information and your money. To make a reservation please click Register Online. Hotel reservation follows registration. The South Point Hotel in Las Vegas has over 2,100 deluxe guest rooms with the top floor of the hotel containing all suites. Guests can enjoy views of the glittering Las Vegas Strip or the serenity of the surrounding mountainscape. Each oversized guest room functions more like a mini-suite with state-of-the-art LED screens and high speed internet. Suites range in size from 900 to 2,500 sq. ft. All accommodations feature the finest amenities and materials.